Arnaldo Mariano Suarez informed us that Roxette is to play in Santiago de Chile for the second time during this amazing World Tour. Their gig is scheduled for Saturday, May 5 at Espacio Riesco and tickets should go on sale tomorrow, March 22. Previously it was said that Roxette might play a concert a day before Buenos Aires date on April 23, but it was officialy denied by Roxette management. 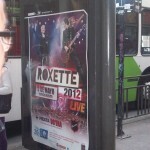 The promoters T4F & Escenario are affraid to communicate the cancellation of the concert “Roxette Charm School” which was scheduled on May 5th 2012. The cancellation is due to the fact that Roxette will perform a concert on a date too close, in the city of Santiago de Chile, which creates logistical problems such as lack of time and flight links that makes their concert not possible in our country. 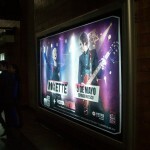 The Producers also report that the return of the tickets for the concert “Roxette Charm School” will be held from Wednesday, March 28 until Wednesday, April 4 2012, from 09:00 to 12:00 and 14:30 to 17:30. Here is the scan from one of Chilean papers sent us by Claudio Méndez Rojas. Thanks!